Fifty years ago this spring Arthur Lydiard set foot on Finnish soil as the most expensive coach in the history of Finnish athletics. According to contemporary observers, the descendants of Paavo Nurmi and other early twentieth-century ‘Flying Finns’ had turned into third-rate runners. The diminutive remedy carried a New Zealand passport: Lydiard’s protégés had taken the world of running by storm in the early 1960s, and his Finnish employers, of course, expected the middle-aged guru to bring the glorious past swiftly back. By the time his two-year stint expired, Lydiard had fallen in love with a Finnish gymnast who’d follow him into New Zealand, but running-wise his stay had been less successful. Had the Finnish Athletics Federation made a massive misinvestment? The two Finnish participants in the 1968 Olympic distance events on the brand-new all-weather Mexico City track didn’t even make it to the semifinals. Instead of saving the face of Finnish runners, Lydiard had merely enriched himself! The critics were guilty of an elementary error – impatience. Soon after Lydiard’s departure the Flying Finns came back with a vengeance. Juha Väätäinen, Lasse Viren and others amassed gold medals and smaller prizes in the Olympics, European Championships and World Cross-Country Championships. Though Lydiard had had little personal contact with any of them, he had inspired an entire generation of Finnish youth and modernized their coaches’ thinking. Given the globalization of sport in general and running in particular, the exploits of Viren and his compatriots surely count among the most miraculous feats in the history of athletics. Unlike Paavo Nurmi’s generation, the second wave of fleet-footed Finns faced opponents from the six inhabited continents, including Africa. At the time, the population of the tiny little nation didn’t surpass five million! Not surprisingly, the second coming of the Flying Finns barely extended beyond the late 1970s. The phenomenon known as African running gathered momentum, and the popularity of team sports led to the eclipse of solitary footsports in Finland. History, however, tends to repeat itself – at least as a farce. In the 1990s, Finnish running activists employed a Kenyan coach whose self-declared mission was to repeat Lydiard’s trick. True, Mike Kosgei had looked after the world-beating Kenyan runners for years, but training fin-de-siècle Finnish youth proved an uphill struggle, not just literally on the slopes of the Rift Valley where they set up a training camp. To make matters worse, Kosgei’s terms of employment were soon contested, whereupon the dream of yet another era of Flying Finns died. 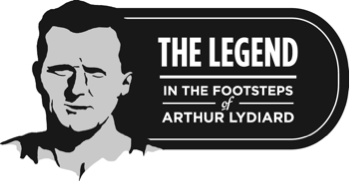 While the Finnish chapter in the history of distance running may well be closed, Arthur Lydiard’s role in the reemergence of Finnish running awaits academic analysts. By any standard, the rebirth of the Flying Finns was an extraordinary event, fully comparable to the Swedish ‘tennis wonder’ in the last quarter of the century. To what extent did Lydiard single-handedly streamline training practices in Finland? How many talents were lost due to his strict ‘100 miles a week’ regime? Did his local foes, among them the old and embittered Paavo Nurmi, manage to prevent an even longer hegemony of Finnish runners? And finally, where, oh where is the Great White Hope who’d at last overtake the seemingly indefatigable East Africans? (1) Lydiard was strict on periodization. His runners worked to the main event of the year neglecting the money making races prior to the top event. With intervall training you can stay in a relatvely good shape, make more money for 3 months, instead of winning the big one (and make money only in the 6 weeks thereafter). The changing of this emphasis was not what race organizers want. (2) 100 miles of basic training near the anaerobic threshold is no fun in a cold winter. If you run 100 miles more slowly (more agreeable in ice and snow) you ignore a Lydard-type base. The change of this was not going well with doctors afraid of bronchitis for the runners. (3) Lydiard had hill jumping for 6 weeks in spring between basic training and track training. There are not enough hills sufficiently high with a proper incline in most of Finland, demanding training camps outside. Hill jumping looks strange, but it helps hitting 100 % your center of gravity. If you look at the photos of Pekka’s sprint down the homestraight in Munich you can see the long term effect of learnng how to hit your center of gravity when running completely anaerobically. Many coaches at the time demanded 100 miles a week (some even more), but the hill jumps were/are a Lydiard distinguishing feature. Good to hear a German expert’s take on Lydiard’s legacy! (1) Yes, periodization was crucial for Lydiard; it was also something that few Finnish runners mastered, or cared to master, in the 1960s. (2) Ironically, Lydiard insisted on Finnish athletes training in Finland throughout the winter months, but many of them soon disappeared into far-away training camps. (3) ‘Hill jumping’ was indeed a controversial feature in Lydiard’s regime, and many runners (e.g. Lasse Viren) never really practiced it.